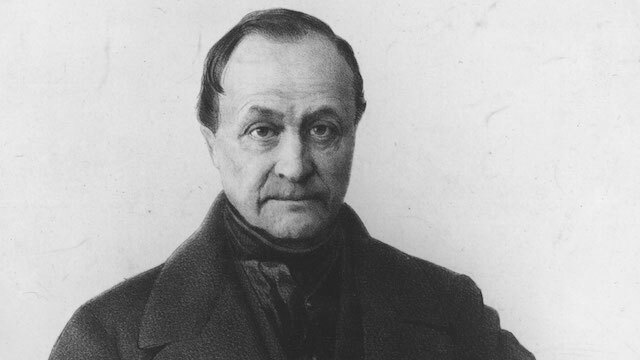 Auguste Comte: High Priest of Humanity? Having plowed the first furrows in the field of a new philosophy, August Comte had a profound effect on the most noted philosophers of the 20th century. His was a fact-based system that took into account human pride, greed and evil. Yet it was also intensely optimistic and seemingly practical. Comte revised humanity’s view of its own capability and sought to fan into life a flame of hope that would free people from their slavery to superstition. Born into a royalist Roman Catholic family at Montpellier, France, early in 1798, Comte proved to be a gifted child. He distinguished himself in his early years at the local technical school but gained a reputation for being rebellious. Achieving some success at the École Polytechnique in Paris, his first ambition was to teach in this same beloved school. His rebellious spirit lost him this goal, though, and for lack of money he took on private tutoring jobs. Subsequently he hoped to get a fresh start in the United States, but this plan, too, failed to see fruition. At the age of 19 he found a position as personal secretary to Count Henri de Saint-Simon, the hugely influential French philosopher who suggested that the study of society should be treated as a science. Deeply moved by Saint-Simon’s rhetoric, Comte, who later coined the term sociology, set about to formalize his own ideas. For seven years the two shared the credit for several thought-provoking essays in which can be seen strands of what became positivism, the distinctive philosophy of science introduced and fostered by Comte over the remainder of his life. By 1824 Saint-Simon and Comte found themselves in opposing philosophical camps, and the two parted ways. Comte wed Caroline Massin in 1825, but the marriage was unhappy, characterized from the start by violence and separations. For several years he lived in penury, attempting suicide on at least one occasion. Between 1830 and 1842, while still a virtual exile from academia, he wrote his most important work, the six-volume Cours de Philosophie Positive (Course in Positive Philosophy), in which he further developed his radical theory. Comte’s initial insistence was that scientific thinking was much to be preferred over bland acceptance of imposed or inherited rules. He made the case for sociology itself to be treated as a scientific discipline, with firm, observable facts and empirical data. During this fruitful time Comte’s finances remained tentative, though his mental and emotional state became more stable. But in 1842, his wife finally left him for good. In late 1844 Comte found both muse and patron in Clothilde de Vaux, herself abandoned by her husband. Clothilde insisted that, as she was still officially married, their relationship could never be physical, but she cooperated with him and encouraged him to develop his ideas further. Though she died of consumption about a year later, Clothilde proved to be a prime influence on Comte’s evolving philosophy. When he had written essays with Saint-Simon years earlier, the germinal idea was that the scientific disciplines had all experienced a similar history, having moved from knowledge based only on mythology to knowledge calculated and deduced from real data. Rather callously he called the first two stages in this three-stage progression theological and metaphysical (or abstract). The third and final stage, which Comte believed was only then beginning to dawn, he called positive. In the theological stage, he maintained, the human mind seeks to understand the phenomena it observes, and satisfies itself with supernatural explanations. In the metaphysical stage, the mind accepts that natural forces are at work, but it conceives of them only in abstract terms. As time went on, Comte poured scorn on the first stage, very much in line with his own declaration of atheism in his teens, and had little more respect for the second, though he believed that both stages were essential in what he saw as the evolution of the human mind. He reasoned that knowledge is useless if it does not go beyond superstition to an understanding of the laws that govern what we observe and experience. For example, a child is told not to try to move a heavy object: that is theological knowledge. When the child is older, he or she learns that there is a natural force that causes some objects to be heavy: that is metaphysical knowledge. From the facts of this second stage, the child is eventually able to grasp the concept of gravity—the law behind the phenomenon in question: this is positive knowledge. Comte asserted that even the so-called soft sciences, such as sociology, bear out this pattern of development. Through the eyes of Clothilde he came to see sociology—particularly his own brand—not only as a hard science but as a tool for bettering the world. He surmised that social problems could be engineered away by big, positive policies. After the death of his beloved Clothilde, however, Comte began acting in decidedly nonscientific ways. He became inextricably involved with mysticism and embarked on a self-prescribed course of “cerebral hygiene,” wherein he would not allow himself to be contaminated by the inferior ideas expressed by other lecturers and authors. Comte came to believe that the ultimate goal of humanity was to learn to worship itself. In 1849 Comte applied his hand to calendar reform, suggesting a 13-month year, each day of which was dedicated to someone he considered a champion of humanity. At around the same time he founded the Positivist Society, still in existence today. He came to believe that the ultimate goal of humanity was to learn to worship itself. To that end he established the universal religion of humanity and declared himself its high priest. His positivist theory developed into a program for the future of humankind: he reasoned that feckless leaders imposing rules had ensured that the past was strewn with war, but that right thinking, as he defined it, would ultimately sweep away such conflict. Yet, in spite of Comte’s devoted efforts, humanity seems no nearer the exalted goal of perfection. Even though today most sociologists shudder at Comte’s totalitarian version of positivism, his influence is still great. Countless social improvement measures bear testimony to his principle, and many people inadvertently fall into the trap of thinking that humanity can better itself morally through willpower alone.